In 2013, the Centers for Disease Control and Prevention (CDC) estimated approximately 2.5 million emergency department visits and 282,000 hospitalizations in the United States were a result of traumatic brain injury. Traumatic brain injury (TBI) is an insult to the brain caused by external physical force that disrupts normal brain function. This results in an impairment of cognitive abilities or physical functioning. In 2013, the Centers for Disease Control and Prevention (CDC) estimated approximately 2.5 million emergency department visits and 282,000 hospitalizations in the United States were a result of TBI. Traumatic brain injury often causes severe cognitive and neurological impairment which can incapacitate the patient, reduce his or her quality of life, and impact interpersonal relationships with family and friends. The severity of a TBI may range from mild to severe with mild TBI (also known as concussion) accounting for 94.5% of all cases. The current medical standard of care includes conducting a CT scan of the head but, unfortunately, over 90% of patients with mild TBI have a negative CT scan and doctors and caregivers do not receive the clear and objective data needed to care for the patient. 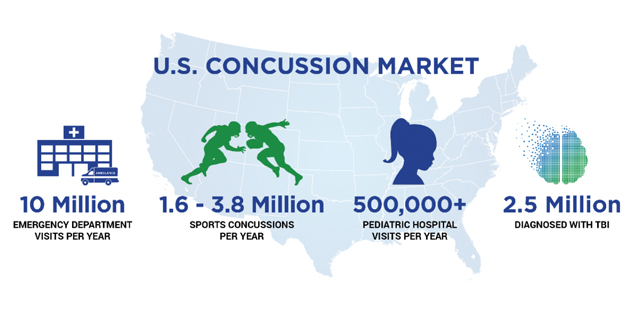 This is especially concerning, because according to the Journal of the American Medical Association, Emergency Department visits have spiked by 30% due to heightened awareness of the additional risks associated with concussions.